Monday, Dec. 27, 1880 started out as a good day in Newburyport. The weather was fine, the Christmas weekend was over and the school kids had a few days’ vacation. People were back to work and the shops were unusually busy for that time of the year. However, before the day was over, a tragedy in the downtown would cost four lives and cast a pall of sadness over the entire city. 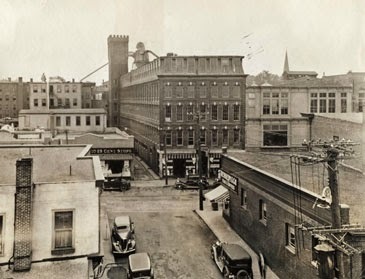 Close to 1,000 people were employed in the four-story brick factory that extended from Pleasant Street to Prince Place. The E.P. Dodge Shoe Company and the N.D. Dodge Shoe Company each employed well over 400 and a yarn shop employed 60. The length of the building had been extended to Prince Place earlier that year and a new chimney was built and two new boilers were installed in the boiler house attached to the west side of the building. Thomas P. Harrington was the engineer in charge of the boilers. He was from South Boston and only had been employed for about a month. Some of the locals were skeptical about his engineering abilities, but many others gave him high marks. Mr. Harrington’s wife and young son had spent the weekend in Newburyport and were planning to move there soon. The mood of the day changed at 12:45 that afternoon when the two new boilers exploded with great force and a blast that was heard and felt through most of the city. The boilers and the boiler house were blown to pieces. Besides the four deaths, over two dozen other persons were injured. Extensive damage was done to many nearby buildings, as bricks from the boiler house and parts from the boilers became lethal weapons as they flew in all directions. Parts of the boiler struck a house on Green Street. Windows were shattered all over the entire area. When the dust and live steam had cleared, a search of the debris looking for survivors was started and soon the body of Mr. Harrington was found. Soon after Daniel Bridges Jr., age 40, was found, he died shortly after being taken to a neighborhood home. Bridges worked in the factory and it was thought he was in the boiler house visiting Mr. Harrington on his noon break. John Bailey, age 30, was employed at the heel shop of Waldo Smith on Hales Court. He was standing near a window and died instantly when struck by a brick. Ten-year-old Oscar Salkins was on school vacation. He was sitting in Chases Heel Shop on Hales Court where he always visited and was known to all the workers. Oscar was also struck by a brick. He was carried to his nearby home, where he died that evening. Mrs. Harrington and her son had returned to Boston that morning. Following the accident, no one knew how to contact her; nobody knew the family address in Boston. She first learned of her husband’s death from a neighbor who read about the accident in a Boston paper the following morning. Following the tragedy, an inquest was held to determine the cause. Many experts were called to testify and many different opinions were given; but without any survivors from the boiler house, no decision could be reached. The new chimney that I mentioned was completed in May of 1880. On the chimney still standing at the site you can see the date 1880 in the brick work facing Prince Place. In the papers after the incident there is no mention of the chimney. Being so close to the origin of the disaster, it is hard to believe it was not toppled. 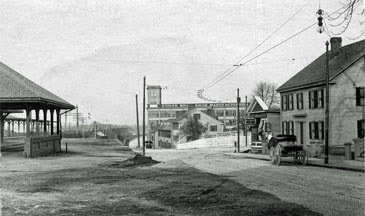 Railroad depot on left and the E. P. Dodge Shoe Company in the center. Courtesy of the Newburyport Public Library Archival Center. 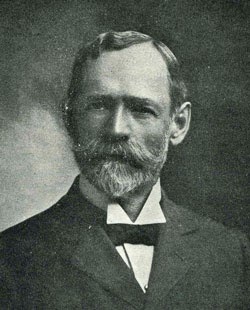 Portrait of Elisha P. Dodge. History of Newburyport, Massachusetts by John J. Currier. Joe Callahan is a former fire chief of Salisbury who is interested in historical accounts of the area.